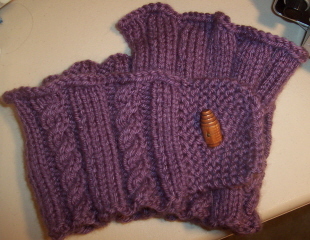 Time & effort involved - Not much, although there seems to be an inordinate amount of knitting in something so small! Comments - I love the pattern, hate, hate, HATE the yarn! I wanted something wash & wear for my friend and decided to try Lion Brand's Vanna's Choice. I might as well have used scratchy old wool or nasty Red Heart. It was plasticy & scratchy to knit with and (doh!) feels the same way on your neck. Never again. The pattern needs a yarn with body to keep the ruff standing up so I'm afraid the "soft" version of the cheaper acrylics wouldn't do well. Maybe a run through the washer & dryer will soften it up? I'm thinking of using a 100% silk yarn, like Elann's Silky Tweed, although if I ordered from them I wouldn't get it for several weeks due to the holiday vacation. Soooo..I'll see what I have on my shelves. I'll lose the ease of care factor, but it'll be worth it for comfort. It's very pretty, although I bought some Vanna yarn to make Elena a hat, I don't know if I would use it for anything else. The wool hat I made her made her head "itchy" and she picked out the yarn, so whatever. Happy Winter Solstice to you too! Elena's bummed because it usually falls on her birthday, but because of the 1:00 AM thing, it pushed it up a day. Peeking out from under my rock to say....Mmm, yeah I was not overly impressed with the Vanna yarn feel myself, so I haven't tried it yet. Have a fabulous holiday Ms Bron! Oh, annoying! But at least it's reasonably small. The Ref is my new favorite Christmas movie. I like White Christmas & Christmas in Connecticut (w/Barbara Stanwyck) but I haven't seen the latter in years. A nice nuclear family Christmas sounds lovely. The final product looks beautiful, though. And I love that classy button. I'm not impressed with Vanna's Choice either. I got the sense that it was scratchy even before I touched it. And the colors don't jump out at me either. I was looking at it to make an afghan for a secret santa gift, but chose Red Heart instead.